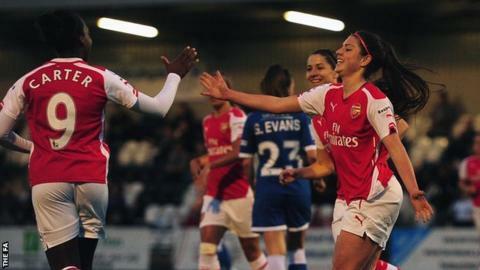 Arsenal Ladies secured their first league victory of the season with a home win over Bristol Academy. Carla Humphrey gave the hosts the lead from close range after good work from Dan Carter. Vicky Losada doubled Arsenal's lead with a half-volley into the top corner after Alex Scott headed Rachel Yankey's cross back across the goal. Bristol improved after the break but fell to their fifth straight defeat in all competitions. After Sunday's FA Women's Cup quarter-final loss to Chelsea, Arsenal looked much improved and showed more of the fluid passing that you would expect from the most successful club in English women's football. The Gunners took a 15th-minute lead when Carter burst down the right and squared the ball to Humphrey, who tucked the ball home right-footed from eight yards out. Bristol Academy have only ever beaten Arsenal Ladies once, having enjoyed a 2-0 victory at Borehamwood on 25 May last season. Midfielder Jordan Nobbs was pulling the strings for Arsenal in the first half and almost doubled their lead after neat link-up play with Leah Williamson, but her effort was deflected wide by Bristol's Grace McCatty. Jemma Rose's looping header was then cleared off the line as the home side continued to dominate, and Losada extended their advantage with her first goal for the club. Yankey's cross to the far post was nodded back across the box by Scott and, while goalkeeper Mary Earps got a hand to Losada's effort, she could not keep it out. Winger Nadia Lawrence had Bristol's best chances of the first 45 minutes but she could not find the target. After the break, the visitors showed more attacking intent, as Sophie Ingle fired a low shot wide and Lawrence's effort went straight at Siobhan Chamberlain. Bristol captain McCatty then appeared to be brought down in the box but referee Sian Piret waved play on, before Carter almost added a third for Arsenal but could only find the side netting. In the closing stages, Alex Scott almost caught Earps off her line with an audacious lob, before Carter hit the post from inside the six-yard box after substitute Lianne Sanderson's effort was saved. The result leaves Bristol bottom of WSL 1, having lost five games out of five in all competitions this season. "We needed a reaction. I have to congratulate my players because it was a difficult mental situation and they responded really well. "Especially in the first half, it was a good reaction, good energy, pressing high and playing good football. "We scored two goals but we could have scored more. I'm very happy with the team." "I thought we were the better side in the second half. We were massively unlucky not to have a penalty in that second half. "We were on the front foot. At 2-0, it is a dangerous scoreline and if we get one back through a penalty, at 2-1 with 15 minutes to go, you never know what could happen. "If that is a penalty and if it goes in, potentially, it changes the game." Arsenal Ladies: Chamberlain, Scott (capt), Mitchell, Rose, Stoney, Williamson, Nobbs, Losada, Carter, Yankey, Humphrey. Substitutes: Byrne, Ubogagu, Weir, Bailey, Sanderson, Oliver, Natalia. Bristol Academy Women: Earps, Dykes, Townsend, McCatty (capt), Matthews, Ingle, Evans, James, Ladd, Lawrence, Watts. Substitutes: Evans, Murray, Passariello, Fantom Brown, Simmons-Bird.